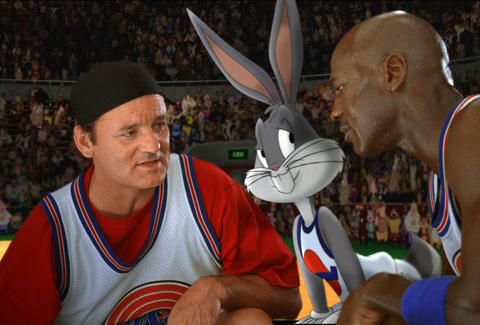 Released in 1996, Space Jam stars two of the most iconic figures of the 20th century: cartoon rabbit Bugs Bunny and human basketball player Michael Jordan. A mix of live action and animation, Jordan and Bugs are supported by the full roster of beloved Looney Tunes characters, with cameos from a who's who of mid-'90s NBA stars. The film is a classic tale of underdogs overcoming great odds to win, though in this case, the underdogs mostly prevail because they recruit the best player on the planet to help them defeat a team of alien monsters who want to turn them into slaves. Here, 23 things you may not know about the movie. The Harvard College Sports Analytics Collective tallied all the stats from the game between the Tune Squad and the Monstars, then extrapolated those numbers over a regulation 48-minute game. The results: Jordan led all scorers with 44 points on perfect 22-for-22 shooting. He scored more than half his points on dunks -- though that's not a surprise, considering that more than 85% of the points in the game came on slams. The same number-crunchers broke down how much each Monstar contributed to the loss. As you'll recall, the five aliens steal the talents of five NBA players: future Hall-of-Famers Charles Barkley and Patrick Ewing; Larry Johnson, who by then had played in two All-Star Games; plus Shawn Bradley and Muggsy Bogues, who are best known to hoops fans as being really tall and really short, respectively. The Monstar with Bogues' talent at least notched six assists, but neither he nor the Monstar with Bradley's ability scored any points. Bradley's Monstar actually doesn't register any stats in the game: no points, no rebounds, no assists -- not even any blocks. The movie filmed in the summer of 1995, just after Jordan returned to the NBA from his stint playing Minor League baseball. Producer Ivan Reitman said in a 2013 interview that the studio built a temporary indoor gym for Jordan on the Warner Bros. lot so he could train and take part in pickup games. Said Reitman: "Every evening after shooting was done, he'd have this whole very complex workout regimen, after which there was a 90-minute game." Dubbed the "Jordan Dome," the gym hosted games with whichever NBA players happened to be around. "While out in L.A., [Jordan] basically let it be known that any of the NBA guys who were in town should come and play with him," said Jordan's former teammate Steve Kerr in a 2003 interview. "They had unbelievable games all summer long. That meant that when Michael came to training camp he was in incredible shape and incredibly motivated." Among those who played with Jordan that summer: Shaquille O'Neal, Reggie Miller, and Magic Johnson. 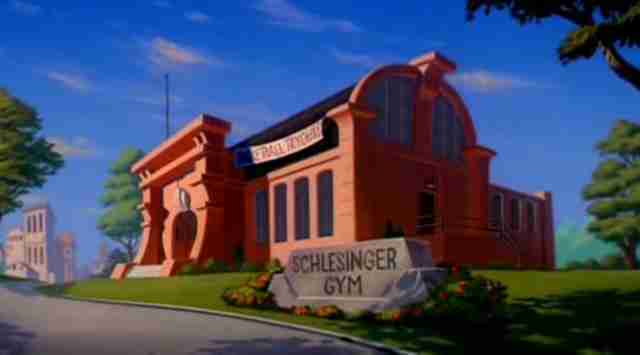 The gym where the Tune Squad holds its tryouts is called Schlesinger Gym -- a nod to Leon Schlesinger, who founded the studio that ultimately became Warner Bros. Cartoons, and who produced some of the earliest Looney Tunes material. In December 2010, a Reddit user noticed that Space Jam's website, a glorious time capsule of 1990s web design, was still online -- a relic of an era when promoting a film with a website was still a relatively new concept. According to Erik Malinowski's history of the site for Rolling Stone, once the Internet rediscovered the long-forgotten site and started sending it loads of traffic, one Warner Bros. executive ordered it taken down. Thankfully, he was convinced to flip it back on, and the site lives on to this day -- a fact confirmed by the Twitter bot @spacejamcheck, which every three hours verifies that the site's still online. 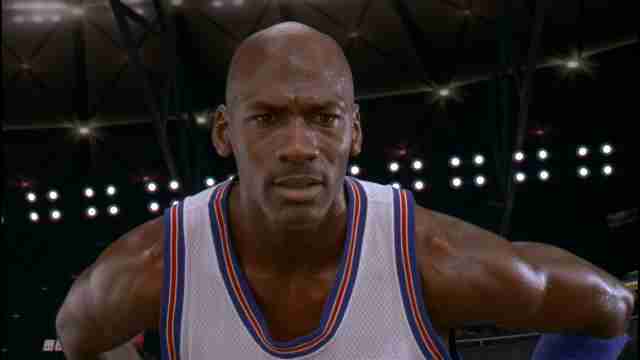 Said His Airness at the 1996 premiere in New York: "I'm a learning actor, I can't say I'm good. This is a whole new arena. I've done commercials, which means four-hour, six-hour days. This is a long process, very meticulous, especially when you're trying to match up with an animated character you can't see." Roger Ebert gave it 3.5 out of four stars, but Space Jam has a Rotten Tomatoes score of just 36%. According to the Chicago Tribune, though, it grossed $90.4 million in the United States and $230 million worldwide. Not a bad return for a movie that cost $90 million to make. It's still the highest-grossing basketball movie ever -- some $14 million ahead of White Men Can't Jump. 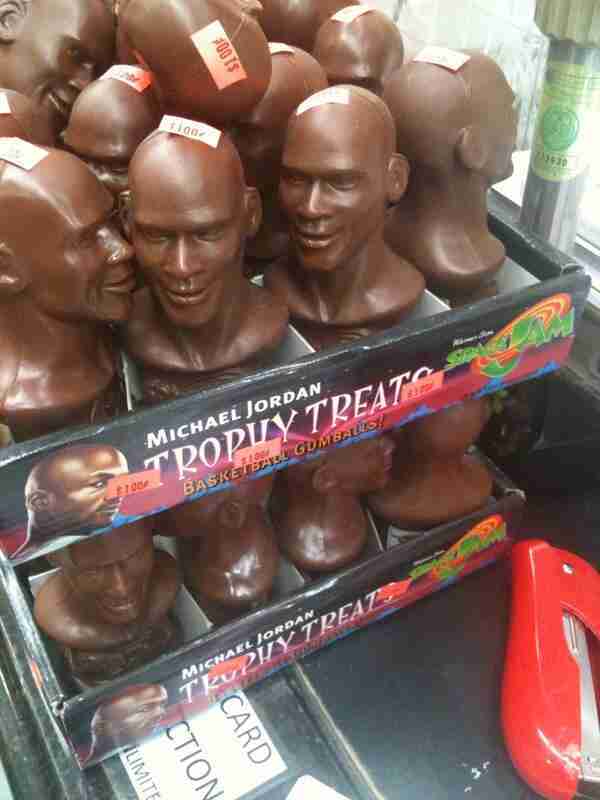 There were 78 different tie-in products, from shower curtains to candies that came in a mini-bust of Jordan. Altogether, $1.2 billion worth of Space Jam merch would be sold. Speaking of that candy, by the way: somewhat concerningly, at least one store was still selling it as of 2014. With artists like Seal, Coolio, Monica, and the Quad City DJ's, the movie's soundtrack has sold more than 6 million copies. Its biggest hit: R. Kelly's "I Believe I Can Fly," which won three Grammy Awards. The record finished the 1990s as the decade's 69th-best-selling album. Lola has appeared in various Looney Tunes productions since, but she made her debut in Space Jam as a 'toon with serious hoops game and a love interest to Bugs. In the film, when MJ requests his basketball gear so he can get ready for the big game, he asks for his old University of North Carolina basketball shorts, which he wears under his game uniform. That's not a bit of fiction added for storytelling purposes: Jordan really did wear his UNC shorts under his uniform throughout his pro career. The Air Jordan XI Space Jam sneakers -- which MJ wore in the film -- are beloved by sneakerheads: when they were rereleased in 2009, fans and collectors camped out to try to snag a pair. And for their 20th anniversary in 2016, Jordan Brand will again sell the sneakers in their original black-and-white color scheme. Knight -- best known as Newman, Jerry Seinfeld's portly TV neighbor and rival -- plays Stan Podolak, a publicist for Jordan's Minor League baseball team who ultimately sees some minutes for the Toon Stars. Knight said of Jordan that "as a physical specimen, I thought that he was the most incredible human being I'd ever seen. He had, like, muscles inside of muscles." It could be intimidating for an actor who, by his own admission, wasn't especially athletic. Said Knight: "People ask me, 'Did you play any basketball with him?' I wouldn't even touch a basketball next to those guys. Are you kidding me? If they passed it to me, I would walk away. I didn't want to be seen touching it." In 2014, the UCB Theater in Los Angeles hosted a live-read of the film, with celebrities like Nick Kroll and Seth Green reading parts. A pair of NBA players joined in, too: DeAndre Jordan read Charles Barkley's lines (as well as those of Swackhammer), and Blake Griffin -- who says he once had a Space Jam-themed birthday party as a kid -- read Michael Jordan's part. It's not out of the question, either. In 2015, James' production company formed a partnership with Warner Bros. to produce movies and TV shows, fueling speculation that the collaboration would one day lead to a new Space Jam movie -- especially since the studio had also reportedly filed for new Space Jam trademarks. Said the president of James' production company in March 2016: "It'd be crazy not to say that it's something on the radar, it's super on the radar, but it's not something we have any news on." In other words: keep holding out hope! There are some meta moments in this kids movie: when Bill Murray explains his appearance at the big game by saying he's friends with one of the producers, knowing audience members get that Ivan Reitman, a producer on the film, directed Murray in classics like Stripes and Ghostbusters. And when Charles Barkley prays that he'll never go on another date with Madonna if he gets his talent back, he's referring to rumors that he and the pop megastar once had a relationship. At one point Daffy suggests naming the team the Ducks, and Bugs replies, "What kind of 'Mickey Mouse' organization would name their team the Ducks?" In 1993, of course, a Disney-owned team called the Mighty Ducks of Anaheim began play in the NHL, taking their name from the children's hockey movie released the year before. How else to close out a Looney Tunes film but a gag built around the traditional send-off line, "That's all folks"? To film Jordan in scenes that were otherwise animated, director Joe Pytka hired a troupe of comedy actors, covered them in green against a green-screen backdrop, and had them run around on their knees so Jordan could interact with them and make it seem, once the animation was added, like he was talking and reacting to Bugs and Co.
Said Pytka in a 2009 interview with the Chicago Tribune: "They were using him for publicity and every day they'd bring in some dignitary to meet him and that started to piss him off." Eventually, Pytka says, "Michael turned to me and said, 'I thought you said this would be [expletive] fun.'" When Pytka told him that it should have been, MJ replied, "So why isn't it?" Added Pytka: "Standing in front of a camera and remember your lines, acting is a devastatingly difficult profession, trying to create those emotions... We were very, very careful that Michael was comfortable when he came on the set. The stuff that irritated him was the PR stuff." In that same Tribune article, Pytka said that finding a name-brand star to appear alongside a novice actor and a cartoon rabbit wasn't easy. Pytka said that Jason Alexander and Chevy Chase turned down the part of Stan Podolak before Knight ultimately landed the role. In the summer of 1995, the Bulls were considering signing Dennis Rodman, the eccentric bad-boy forward known as one of the league's best rebounders. During a break from shooting, Pytka asked Jordan why he didn't want to play with Rodman. "Michael says, 'Because he is a crazy man and the only person I know who's crazier is you,'" Pytka said. "I was like, 'Are you an idiot? All he does is play defense and rebound. You need somebody else to shoot?'" Jordan and Rodman eventually met... and won three titles together as teammates. Said Pytka: "From that day on, he would call Rodman, 'your boy.'" Joe DeLessio is an associate editor at New York Magazine online and a contributor to Thrillist. His favorite Monstar is Bupkus. Follow him on Twitter: @joedelessio.